Arguably the greatest imperial power of the Spiral, Valencia is home to the Unicorns, a vibrant people with an ancient, rich culture. Many of the great discoveries that led to sky-ships and the age of sail were made here - Valencia stands to this day as a center of arts and learning, where scholars and masters from all over the Spiral gather to push the boundaries of knowledge and talent. Marco Pollo, Cowpernicus, Da Finchi - the greatest minds and artists the Spiral has ever known did their greatest work in Valencia, and the entire Spiral is richer for their labors. The Skyways of Valencia have more Stormgates than any other realm in the Spiral - Valencians say their realm is the heart of the Spiral, and most sky charts are drawn with Valencia at the center. 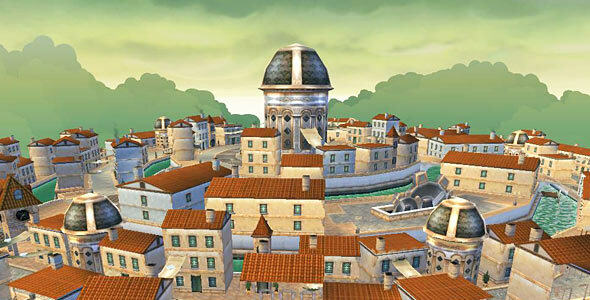 Valencia has used its location to flower into a thriving hub of trade and shipping between the realms. Valencia's emerald skies and lush orchards are hauntingly beautiful, and the Unicorns are an emotional, zestful people whose passions are as stormy as their realm's skies. Unicorns are renowned throughout the Spiral for their talents with poetry, scholarship and fencing. Beneficiaries of Valencia's unparalleled wealth and status, the Unicorns dwell in ornate, baroque cities full of grand plazas, columned palaces, and grand statuary. There is always some grand ball, festival, or masque to offer entertainment and diversion. Duty, honor, and family pride are the pillars of their social order. Valencia is also home to the hardy Crabs and pragmatic Guinea Pigs, who serve as the hard-working middle class to the Unicorn elite. Skilled craftsmen and tireless laborers, their efforts sustain the magnificent (some would say decadent) lifestyle of the Unicorns. Guilds and Merchant Houses of Crabs and Guinea Pigs drive Valencian commerce, and have grown very powerful in recent times. Things are changing in Valencia. The recent invention of Clockworks was a wonder, whose full impact has yet to be seen. Kane and his legions revolutionized warfare in Valencia - at the height of the Polarian Wars, King Casimir turned all control of Valencians by land or sea over to Kane. The Armada won the war, saved the Spiral, and has worked tirelessly ever since. With Clockwork ships protecting merchant ships and stamping out smuggling and piracy, Valencia is growing even richer.